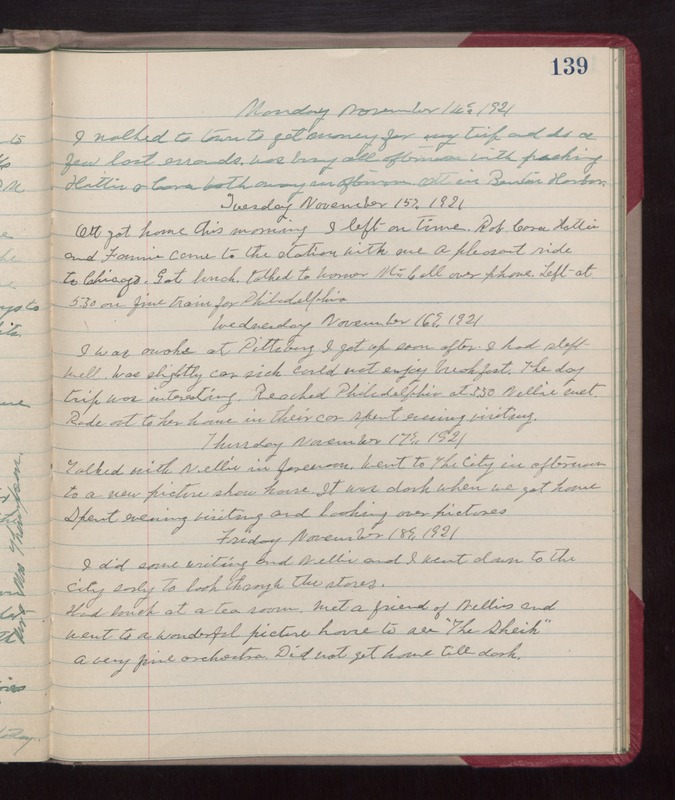 Monday November 14th 1921 I walked to town to get money for my trip and do a few last errands. Was busy all afternoon with packing. Hattie & Cora both away in afternoon. Ott in Benton Harbor. Tuesday November 15th 1921 Ott got home this morning. I left on time. Rob, Cora, Hattie and Fannie came to the station with me. A pleasant ride to Chicago. Got lunch. Talked to Warner McCall over phone. Left at 5.30 on fine train for Philadelphia. Wednesday November 16th 1921 I was awake at Pittsburg. I got up soon after. I had slept well. Was slightly car sick. could not enjoy breakfast. The day trip was interesting. Reached Philadelphia at 3.30. Nellie met. Rode out to her home in their car. Spent evening visiting. Thursday November 17th 1921 Talked with Nellie in forenoon. Went to The City in afternoon to a new picture show house. It was dark when we got home. Spent evening visiting and looking over pictures. Friday November 18th 1921 I did some writing and Nellie and I went down to the city early to look through the stores. Had lunch at a tea room. Met a friend of Nellies and went to a wonderful picture house to see "The Sheik." A very fine orchestra. Did not get home till dark.